The worlds most amazing dark chocolate cake (not as good as my Mum's cake, which is light and fluffy and lovely) - but the best rich, dark, cake. So according to the sign outside a gym I pass on the bus everyday to uni, it is International Fitness Week. So to celebrate, I am providing you with chocolate cake. Not just chocolate cake, but brownie-esque, fudgy, rich, chocolate cake. Yeah, I am aware of the irony. 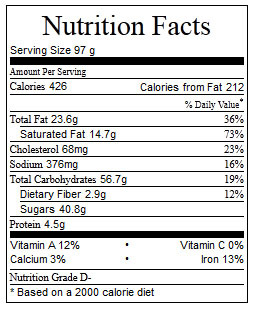 So this cake is not healthy, and if you're counting calories, you won't like it. But if you're like me, and can't resist something rich and fudgy, and feel that if you eat healthy 80% of the time, one slice of cake certainly won't kill you (in fact it will make you feel fabulous), then this is the cake for you. When it is straight out of the oven, the cake is moist, decadent and warm. 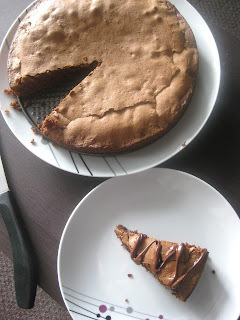 The centre is so gooey it practically melts onto the plate, and the dark chocolate chips, which were not melted before being placed in the cake, melt in your mouth. Served with hot fudge sauce, this dessert would be perfect to share with friends or family. Even better, Easter is only two weeks away and this would make the most amazing lunchtime dessert. You could refreidgerate the cake, and it becomes more like a decadent brownie. It is fudgy and moist after being refridgerated for an hour or two. Served cold, it is almost as good as hot. But not quite. 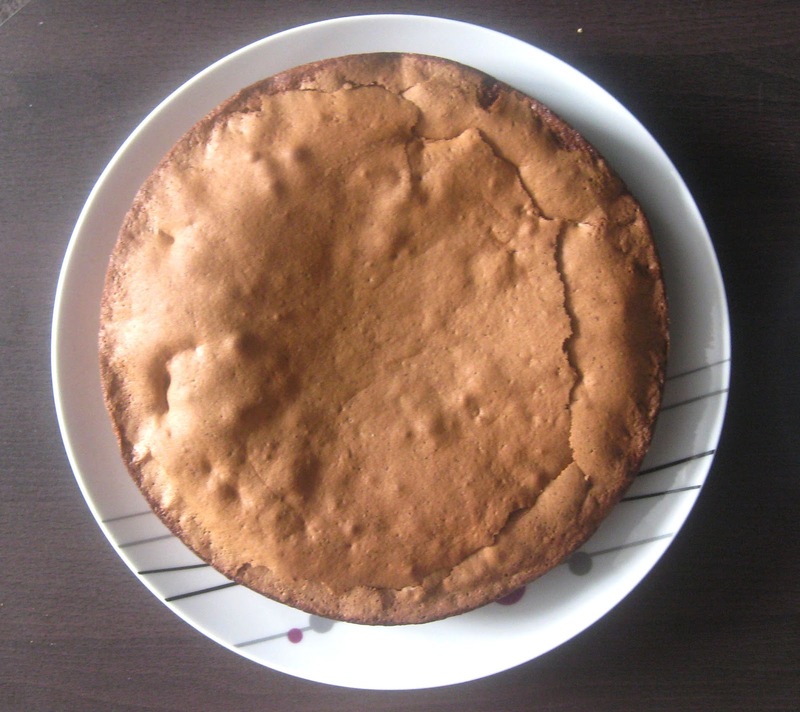 You can also cut this cake anyway - if you want to use a square cake pan and not a round one, feel free to, and instead, as the cake doesn't rise an awful lot, cut the cake into brownie-sized squares. It would make an amazing treat after a long day and would cut down the calorie count if you care. But let's face it, some desserts, like this, are just too good to turn down. Now, about fitness - I feel I should say something, in tribute of fitness week. I am relatively fit. I think, if there were a zombie apocalypse, I may manage to run away for a little bit, but it wouldn't take long for the zombies to track me down and turn me. I do try; I do a good half hour of cardio each day, usually jogging/walking/running. I have also recently started doing pilates, which I absolutely love and my abs are just starting to recover. So all in all, I do a small bit of exercise. I don't love exercise, but I never regret it. And I do feel great after I've done some - it really helps to de-stress me. So, thanks exercise. Now, about that delicious cake. Menu Options: As I said, I would serve this hot with hot fudge sauce or cold like brownies. Serves 8-10 if cut like a cake, or approximately 20 if cut like a brownie (the recipe is thick enough to be a good brownie). 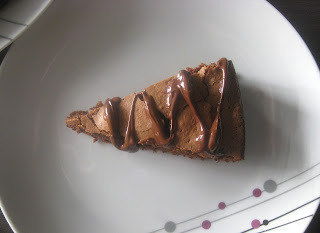 Nutritional value is calculated as if it were cut into 10 cake pieces – I said it wasn’t healthy – it’s just best to ignore the nutritional value here, as everyone deserves chocolate cake, especially one as good as this. Besides, if you did cut smaller pieces, you could easily have some each day as a snack, and it wouldn’t kill you. Good quality chocolate, like this, it’s just a good thing. Really. - Preheat oven to 190 degrees Celsius and oil an 8 or 9 inch round pan. - Melt the 85 grams of chocolate and set aside to cool. - In a large bowl, sift in flour and cocoa and then stir together. - In another bowl, beat butter, both sugars and salt together (I used a handheld beater, but I would have used a stand mixer if I could afford one – do not do the next few steps by hand, use a mixer). The mixture will be crumbly. - Beat in the eggs on at a time until the mixture is smooth. It will be very, very runny. - Finally, add in vanilla and sour cream, and beat until smooth. It is important to make sure the sour cream is mixed in thoroughly and there are no lumps. - Add the chocolate, which should have cooled, and beat until the mixture is dark brown. - Finally add the dry ingredients. Mix together until just smooth – the mixture will be very thick, and be careful not to overmix. - Using a spoon or spatula, not the mixer, stir in the chocolate chips. - Bake in the oven for 20 minutes. The surface will puff slightly and be a light brown. Let cool in pan for a while, then remove from pan. It is up to you to serve it hot, or let cool completely and refrigerate for a couple of hours before serving. Oh, and I am seeing the Hunger Games in a few hours at the midnight premier. I could not be more excited. It's ridiculous. I hope you all have a fantastic mid-week day. And seriously, make the cake.